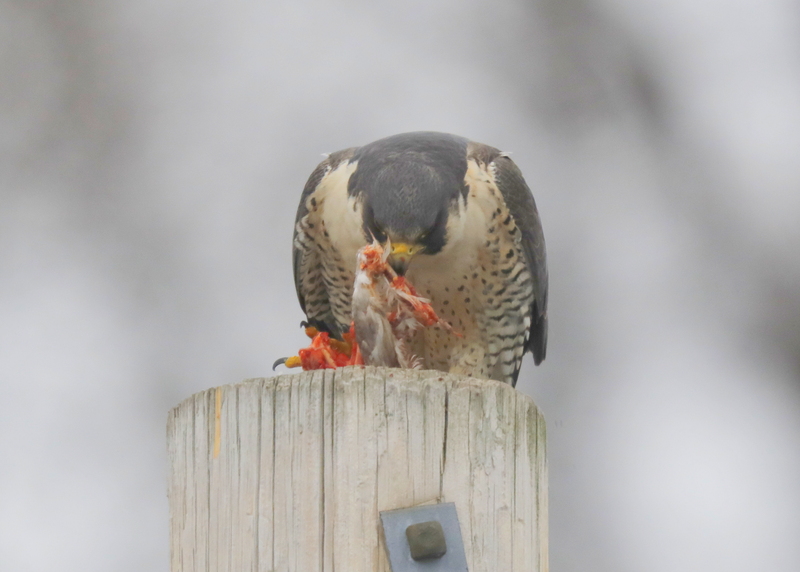 Made a morning to visit to Woburn Peregrines and found the female ripping apart freshly caught prey atop utility pole just to the right of the Herley NE building. 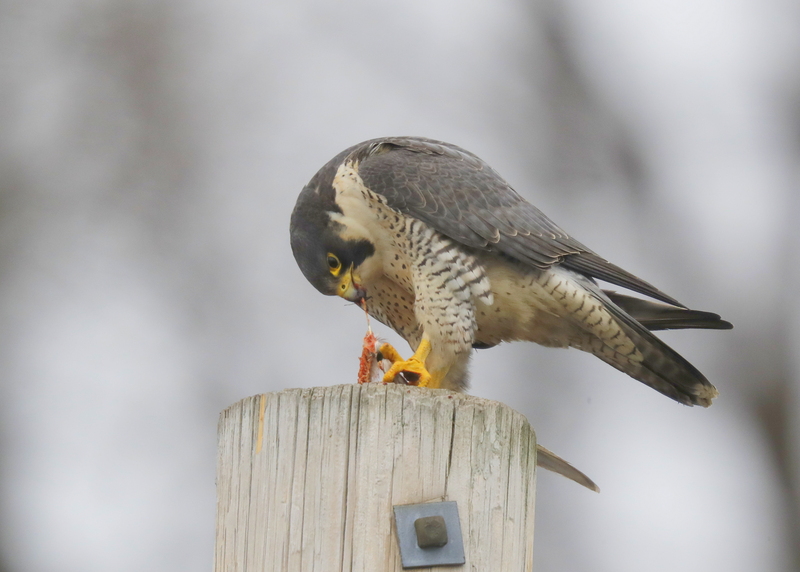 After biting into neck, falcon carries will typically carry prey to habitual plucking perch (tree snag, cliff side, utility pole, building) for consumption, or to cache site. Prey too heavy to carry in flight are partially consumed on ground; remains may later be carried to eyrie or plucking perch, or left in place for later return. The peregrine begins eating by tearing off head; usually consumed if small, picked apart and eaten or discarded if large. Continues by pulling apart and eating skin and flesh of neck (also bones of small prey), working down to breast. Depluming of breast precedes tearing into pectoral muscles, which are usually totally consumed. Viscera may or may not be eaten; often gut is pulled out and discarded, but remaining organs, especially heart and liver, usually eaten. Legs of large prey may or may not be picked clean. Appears to use tomial teeth to break long bones of wings and legs of smaller prey before swallowing. Large prey too heavy to carry back to eyrie are well plucked wing and tail feathers removed, head removed, eviscerated, and sometimes posterior half of carcass detached from breast, before latter carried back to eyrie to feed young.